Now the sun is coming out it’s time for walks on the beach and Pimms on blankets in the park. It’s also to think about protecting your skin from sun damage. I’m all over using acids and retinoids for improving my skin condition. They have helped my appearance no end. The drawback is having to use sunscreen on a daily basis. It’s really important. Without sunscreen you’re going to end up with problems with pigmentation, worsening of wrinkles and changes in texture. I’ve finally found some sunscreens that don’t look white or feel sticky. Here is a guide on what to look for in sunscreen and some really good suggestions. What we need from our sunscreen is protection against the two types of Ultraviolet radiation. UVB, aka UV Burning, are the high energy rays that cause skin redness and skin cancer. The SPF number on your sunscreen bottle refers to protection from UVB. UVA, aka UV Aging, rays have a shorter wavelength, they can penetrate clouds, glass and the deeper layers of the skin. They can cause loss of collagen, loss of skin firmness, wrinkles, increased pigmentation and cancer! UVA is the type of UV radiation emitted by sun beds, so obviously avoid those. UVA protection is referred to by the PPD (persistent skin darkening) number and you might see it denoted with stars or plus signs. There are so many sun protection products on the market, it’s hard to know which one to choose. I have oily acne prone skin and it took me a long while to realise that Sunscreen is a real problem for my skin. I wore it all the time and always had a face full of spots. In a cruel twist of fate, all efforts to do the right thing by your skin can leave you looking shiny, white and spotty. Chemical sunscreens have different protective abilities and can protect from UVA and UVB. They are colourless, odourless and generally thin consistency making them functional face cream additives. They aren’t white coloured or thick like some physical sunscreens. The problem with chemical sunscreen is that it breaks down in sunlight, after a couple of hours they won’t protect you and you’ll need to reapply regularly. Chemical sunscreen has the potential to be irritating to some and possibly cause acne breakouts and flare ups in those with sensitive skin. There have also been questions about the safety of chemical sunscreens in the long term, this is somewhat alarming considering we’re smearing these chemicals on our children. Physical sunscreen reflects sunlight and isn’t broken down so it can give you all day protection. Zinc Oxide protects against both UVA and UVB radiation, Titanium Oxide is only good for UVB protection. Zinc and Titanium Oxide don’t block pores or irritate skin so it’s great for people with sensitive skin or acne. Physical sunscreen is also suitable for use near the eye. Chemical sunscreen can cause eye irritation. The downside is that Zinc and Titanium Oxide is white and thick and gives skin that typical sunscreen ghost appearance, especially in photographs. Sunscreen manufacturers have got round this by making the particles very small (look for the word “nano” in the ingredients list). Physical sunscreen can cause dryness so you will also have to moisturise when using it. In my view Zinc Oxide is the sunscreen of choice- its broad spectrum and not likely to cause a flare up. Sun protection ingredients can break down when exposed to sunlight, when they do they release free radicals which can damage the skin. It is important, therefore, that sunscreen also contains antioxidants to counteract any damage. 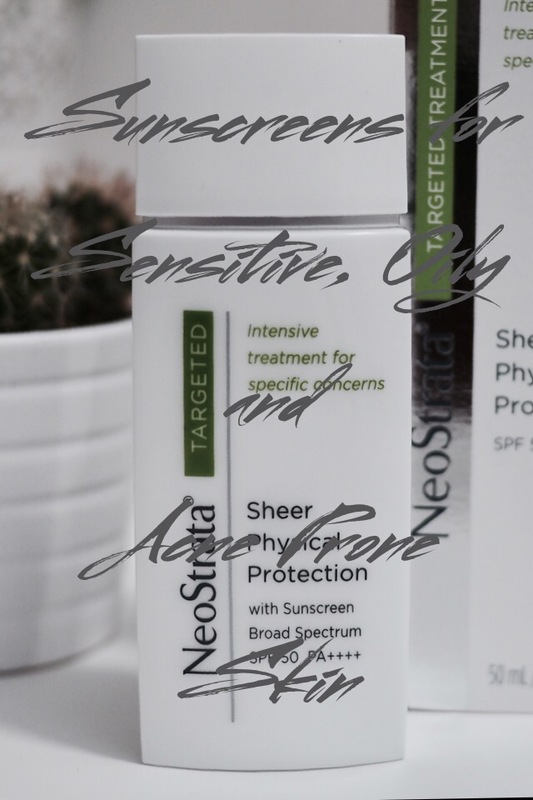 Neostrata Sheer Physical Protection SPF 50 £33- I love this stuff, it’s broad spectrum, slightly tinted and practically invisible. 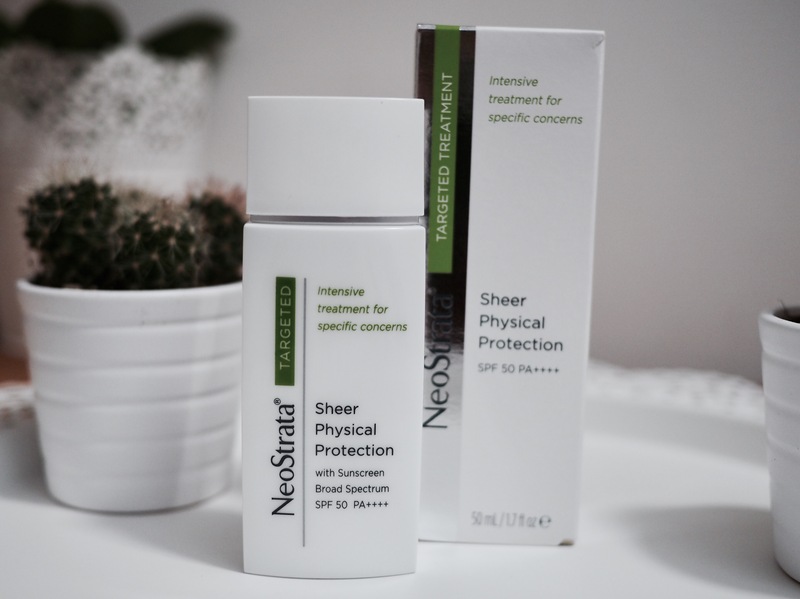 Sheer Physical Protection also contains antioxidants and skin smoothing Lactobionic Acid. Unusually for a sunscreen it has caused me no breakouts whatsoever. Sheer Physical Protection is by far my favourite sunscreen. Elta MD UV Clear Broad Spectrum Protection SPF 46 £28- This is designed with acne and sensitivity sufferers in mind. Also contains anti inflammatory Niacinamide and moisturising Sodium Hyaluronate. Clinique Mineral Sunscreen Fluid for the Face SPF 50 £22- I’ve included this because it’s one of the few mineral sunscreens widely available in the UK in shops. It’s great for sensitive skin but gives a white appearance. Also it contains no antioxidants. Derma E Antioxidant Oil Free Natural Sunscreen SPF 30 £22- Great for sensitive skin, acne sufferers and around the eye area, contains no oil or silicones. I could not find any physical sunscreens that are widely available and cheap in the UK unfortunately. They all contain some chemical sunscreen. I’ve tried loads of different shop bought sunscreens- I’ve posted before about Soltan Dry Touch factor 50 and compared it to La Roche De Posay. They all worsen my acne. I’m fairly sure it’s the chemical sunscreen agents in them that are causing the problem. If you have huge problems with sunscreen or you want to keep skincare as basic as possible you could make your own. Amazon sells cosmetic grade Zinc Oxide Powder and you could mix it with an oil of your choice for simple as poss sun protection. I’m sorry the list isn’t longer. The choice of sunscreens containing no chemical agents available in the U.K. is woefully small. I literally wandered round Boots reading all the labels. None of the big brands, apart from Clinique, do one. If you’re lucky and have normal skin that doesn’t react to anything or dry skin that doesn’t get on with Zinc Oxide, then you have a lot more choice when it comes to Sun protection products. These sunscreens have physical and chemical spf, blend seamlessly with the complexion, make a good base for makeup and don’t give a white cast. 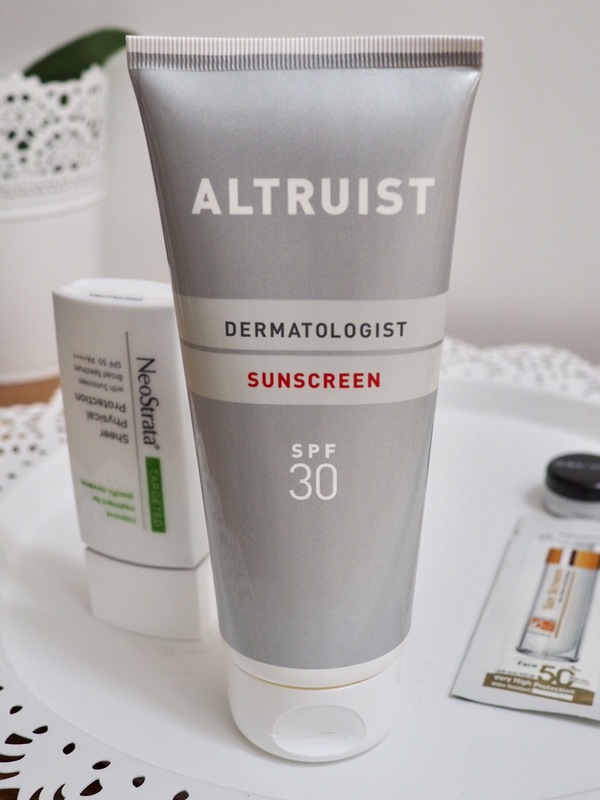 Altruist Dermatologist Sunscreen SPF 50 £8 for 400mls- This is designed by a German dermatologist, its high tech ingredients promise full spectrum protection, no stickiness and no whiteness. It’s a lovely product and extremely cheap. Frezyderm Velvet Face Factor 50 £17.50- Frezyderm is an award winning skin care brand that is still under the radar at the moment. Their Velvet Face sunscreen feels super soft and light, more like an expensive primer than a sunscreen. Body Shop Skin Defense Multi Protection Essence SPF 50 £16- a light as air moisturising “essence” with full sun protection. Eucerin Sun Mattifying Face Fluid SPF 50 £16- Light, non greasy, moisturising and fragrance free. Armani Maestro UV Defense Primer SPF50 £40- This is a cracking makeup primer, feels lovely, is invisible and has high spf. Lots of moisturisers and foundation have SPF but you must not rely on that if you’re going to be outside during the day. You just won’t be wearing the product in enough quantity to provide the amount of protection it promises. Use a third of a teaspoon of sunscreen for the face to get the promised protection. Use sunscreen after your skincare. When your serums and moisturiser has absorbed then you apply sunscreen. Then makeup goes on top. Avoid the eye area if you’re using chemical sunscreen. Reapply regularly if you’re using chemical sunscreen. Reapply after getting wet or sweating a lot. There are a lot more chemical products to choose from and they are much cheaper. If your skin can’t take Octylcrylene and the like then you’ll be spending more money, unfortunately. Which is irritating as I’m sure Zinc Oxide isn’t expensive. If you know of any amazing sunscreen products for oily, sensitive or acne prone skin that I have missed from my list please let me know. See also the EWG guide to being safe in the sun. Next Post Philosophy Skin Care Review|Purity Face Wash, Miracle Worker, Renewed Hope in a Jar and Amazing Grace Body Lotion.